WHO/Europe launched the Flu Awareness Campaign initiative in 2013 as an extension of European Immunization Week. But why a specific campaign on flu? Influenza is usually mild and most people recover quickly. However, this contagious respiratory illness caused by influenza viruses may occasionally cause severe disease and death. 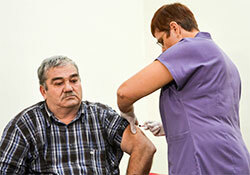 The best way to prevent influenza is by getting vaccinated. As influenza viruses change, a flu shot is needed every year to keep up with the circulating viruses. In the northern hemisphere, the influenza season usually occurs during autumn and winter, and October is an optimal time to receive an influenza vaccination and to start the Campaign. The Campaign aims at increasing uptake of seasonal influenza vaccination in risk groups. Some people, such as older people, pregnant women, young children and people with underlying health conditions are at higher risk of serious influenza complications. In addition, health care workers are more exposed to different viruses on a daily basis, including the influenza virus. WHO/Europe has developed campaign materials for use during the Flu Awareness Campaign, but also throughout the entire influenza season. Campaign messages are tailored to the different audiences and are disseminated via posters, fact sheets, adverts and other channels in local languages.